Sean Recke is a caregiver, fundraiser and patient advocate. He serves these roles in support of his 17-year-old son Adam, who 11 years ago learned he had Niemann-Pick Type C (NPC) disorder, a rare, fatal, genetic disease, also referred to as Childhood Alzheimer's. So when Sean, a Salisbury Middle School teacher, learned the second phase of a national research study of a drug that could help his son was available, he campaigned successfully with Thomas Whalen, MD, Lehigh Valley Health Network's (LVHN) executive vice president and chief medical officer, for LVHN to become a study site. LVHN's participation in the trial means it's closer to the Recke family's home in Bethlehem Township, and convenient for the other families in the Northeast who are desperately seeking an FDA-approved treatment for the heinous neurologic condition from which their children suffer. NPC refers to fat accumulation in the brain leading to toxicity, which destroys the cells that govern mobility and cognition. Symptoms include cognitive/neurologic decline, gaze irregularities, worsening hearing loss, seizures, balance difficulties and other motor deficits. Only 500 confirmed cases have been diagnosed worldwide. People with NPC generally live to be only about 20 to 30 years old. On Dec. 11, 2015, Adam Recke, a Freedom High School junior, became the first subject enrolled in the study at LVHN. This will relieve him and his family of the twice-monthly four-hour commutes to the National Institutes of Health in Bethesda, Md., where he completed the Phase I study of the same drug, called cyclodextrin. This simple sugar compound shows evidence of helping reverse the decline of patients with NPC. On Dec. 28, 2015, Adam had his first cyclodextrin infusion into his spinal fluid at LVHN. He'll continue treatments twice a month over the next two years. "After fighting this horrible disease for 10 years, we are so happy to have LVHN and Vitesse (the study sponsor) working together to finally get an FDA-approved treatment for Adam and all the NPC patients," says Sean Recke. "The care Adam is receiving is outstanding, and we really appreciate all the hard work to get this trial started." LVHN was the third site nationwide to launch this Phase 2 study, through which scientists hope to find evidence that cyclodextrin is effective in reversing NPC. A total of 10 research centers in the U.S. and a few in Europe are expected to do the research. "To enhance how we heal, comfort and care for our community, LVHN maintains a robust research program through our Network Office of Research and Innovation, the area's only organization accredited by the Association for the Accreditation of Human Research Protection Programs," Whalen says. "Discovery and innovation are critical activities that benefit many of our patients." According to Sagan Loburak, LVHN's clinical nurse coordinator for the study, LVHN also has enrolled a 5-year-old girl in the study and hopes to enroll two other patients. The trial is planned to last two years, with a goal to have 51 subjects enrolled in the trial nationally. 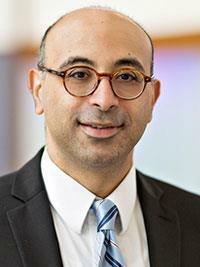 "This research is helping us on the road to find a cure for this devastating disease," says Sameh Morkous, MD, LVHN's chief of pediatric neurology and the study's primary investigator.